Today’s recipe is an example of free form cooking. I had a concept and I set out to create it. This is a very simple, yet tasty meal. This concept was born in the kitchen at work. I was talking pressure cookers with a co-worker of mine (who happens to be German). She mentioned that one of her favorite pressure cooker recipes was Pork Chops with Sauerkraut. 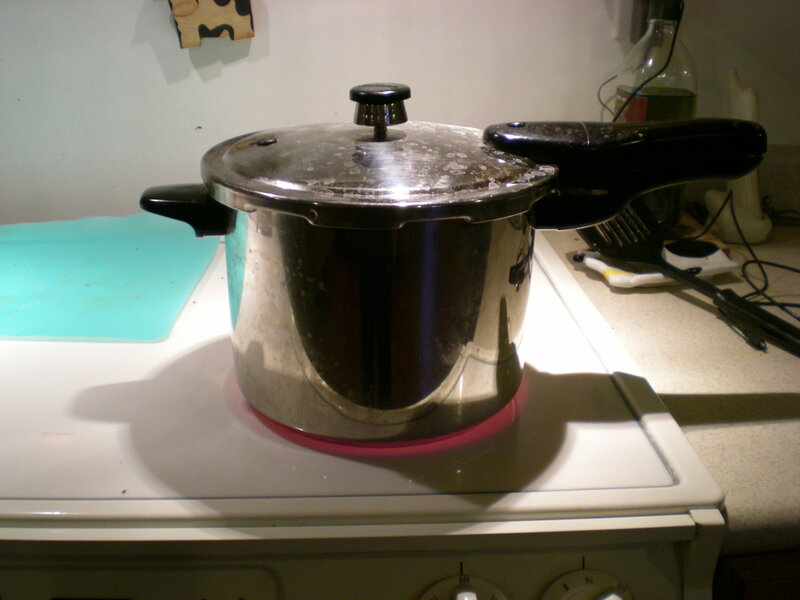 The pressure cooker reduces the Sauerkraut down to a tangy sauce. 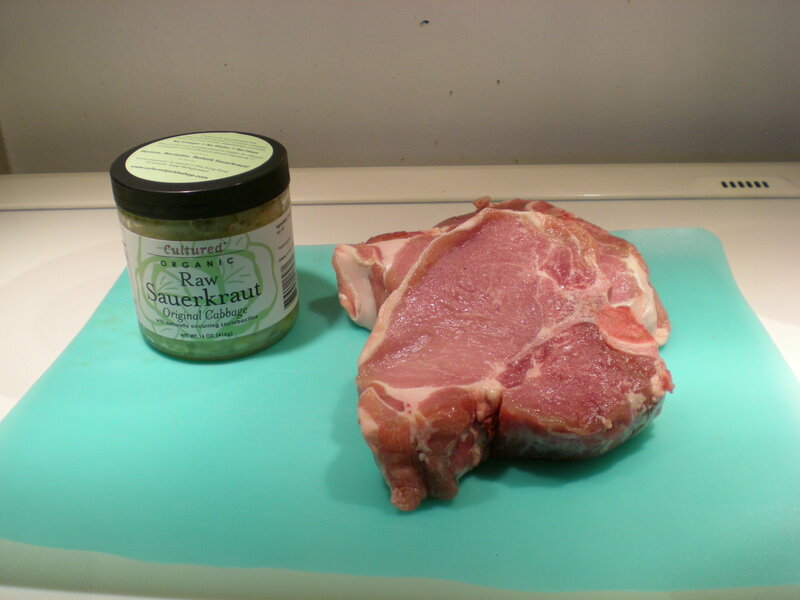 Rub the pork chops with dry mustard. Sprinkle with salt and pepper to taste. Heat the oil in the pressure cooker. 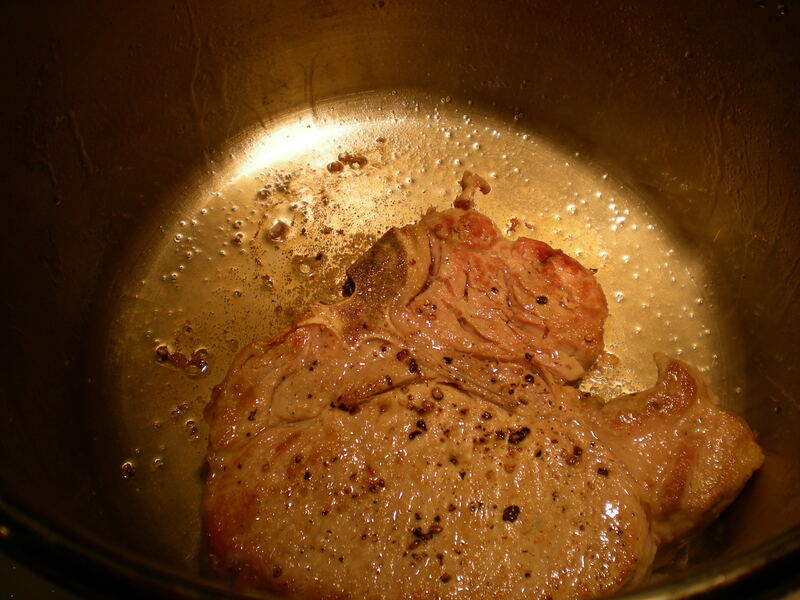 Brown the pork chops on both sides. Add the water to the pressure cooker and place the pork chops inside. 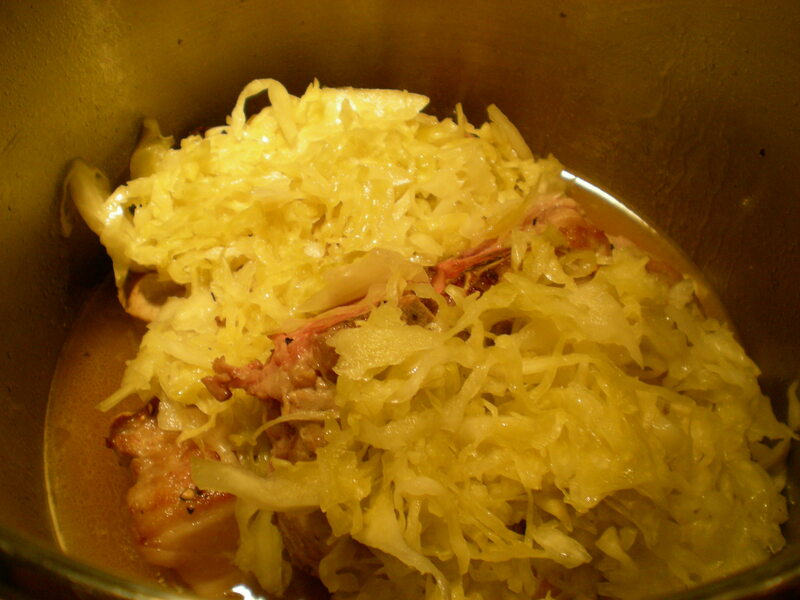 Cover the pork chops with sauerkraut. Lock the lid into place and bring up to pressure on high heat. As soon as the pressure is up, reduce the heat to the lowest possible setting to stabilize and maintain the pressure (on my stove this is medium). Cook 12 minutes. Remove from heat and use the natural release method before opening the lid (let the pressure reduce on its own). 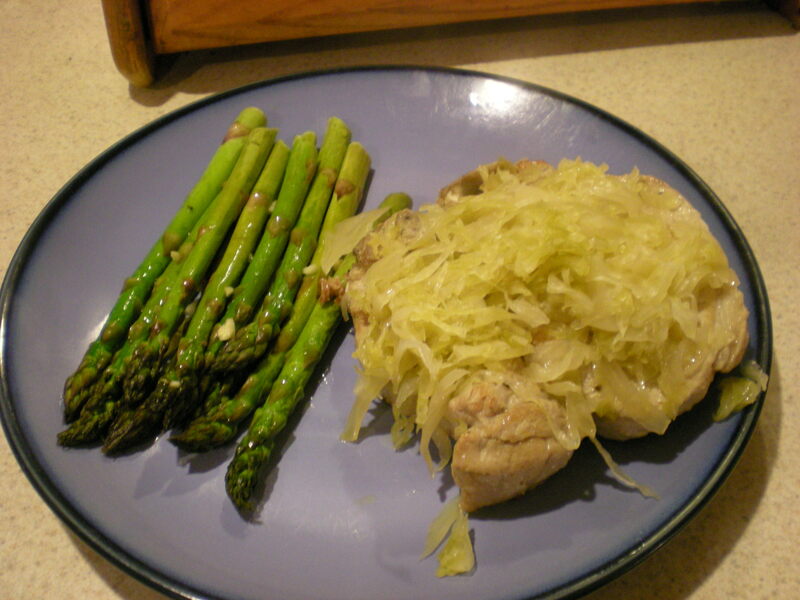 Serve the pork chops topped with the sauerkraut along with your favorite vegetable for a delicious meal. We had Roasted Asparagus. The variations on this are endless. I think I’m going to try it with the Kim Chi I am making for an Asian flair. Sliced apples or pears would also be very tasty, especially combined with some Dijon mustard. This entry was posted in Recipes and tagged Cooking, Low Carb, Paleo, Paleo diet, Paleo Recipe, Pressure Cooker Recipe, Recipe, sustainable food. Bookmark the permalink. Thank you for this recipe. I wasn’t able to find many on Pinterest. I am going to try it with a pork roast and think I have to increase the time to about 35 minutes. Wish me luck. My pressure cooker manual has a recipe that uses a 3 pound boneless rolled pork roast. The pressure cooking instructions for that recipe are to cook under pressure for 60 minutes and let pressure drop of its own accord. The timing listed for a 3 pound bone in pork roast is 55 minutes, again letting pressure drop of its own accord. Guess who got a new pressure cooker for Christmas?! I have always had this feeling of awe when it came to these devices, thinking that the magic would elude me. But alas! Oh my, this was soooo good and wonderfully easy! I prepped my potatoes with 2 cloves of sliced garlic as if I was going to roast them in the pressure cooker and threw them on top of the sauerkraut to cook along with the pork. This was really, really good! Thank you so much for helping me through the first steps to creating pressure cooker magic meals!